Tony Blair has said sorry for the slave trade, months after his statement of "deep sorrow" was criticised by some for stopping short of a full apology. "I have said we are sorry and I say it again," he said after talks with Ghanaian president John Agyekum Kufuor. 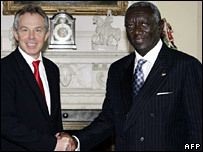 Britain had a "relationship of equals" with countries like Ghana, he said. The most important thing was "to remember what happened in the past, to condemn it and say why it was entirely unacceptable," Mr Blair went on. Some anti-slavery campaigners had said they wanted Mr Blair to go further ahead of the 200th anniversary of the abolition of the slave trade, after his first statement in November. His expression of "deep sorrow" for Britain's role in the slave trade was welcomed by some but criticised by others for not going far enough.